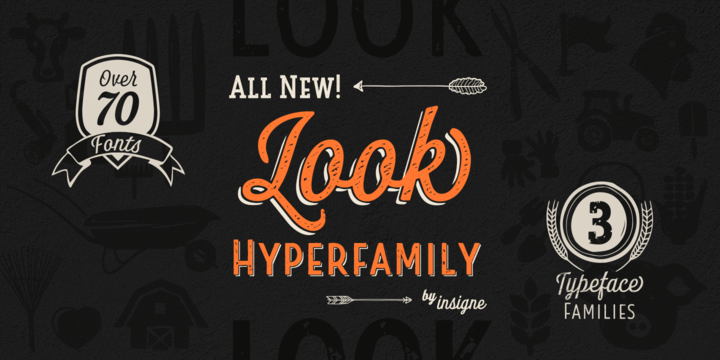 Look is a hyper-family script typeface created by Jeremy Dooley and published by Insigne. Inspired by local Tennessee historic signage, Look features 3 different fonts, each in 3 different weights, including subfamily sans, serif, script, shadows, alternates and ornament fonts! Now Look, you can’t go wrong with it! Trademark: Look is a trademark font name of Insigne. A font description published on Wednesday, March 18th, 2015 in Fonts, Insigne, Jeremy Dooley by Andrei that has 3,404 views.